My friend, Doug the IT Guy, asked me if I had ever been to the pizza place that shows up in the opening credits to The Sopranos (watch here at 1:16). Pizza Land located on the Belleville Turnpike in North Arlington was the featured joint. Not only did I not remember seeing it on the show—which was prior to outing myself as a snob–but I also missed it back in my Jersey days when I must have passed it many times. Early one spring evening, I drove through the swamps of Jersey to give the place a try. 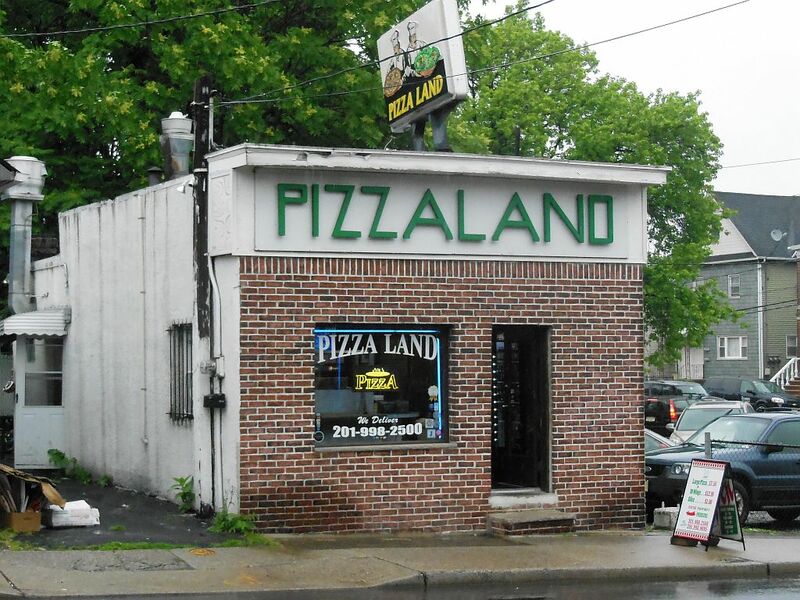 Pizza Land works out of a small free standing building on the north side of the busy pike just past the cemetery. Parking there is scarce, but the joint is only a block or so from downtown where I found a spot on the main street. Pizza Land thrives on delivery business and is really not much of a place to visit and dine in. Its small interior seats only four people at the counter and another four at two tiny tables. As the lone customer, I grabbed a seat at one of the tables and ordered up two cheese slices at the surprisingly low cost of a dollar each. A plain cheese pie sat there in waiting for me, and the cook threw a big slab in the oven that he later cut in two after it was heated up. The slices were quite puny but nonetheless were still a bargain at $1.00. It was like getting a big slice for a deuce. Dinner time was approaching, so I watched the three folk on duty busily handle a heavy volume of phone orders. 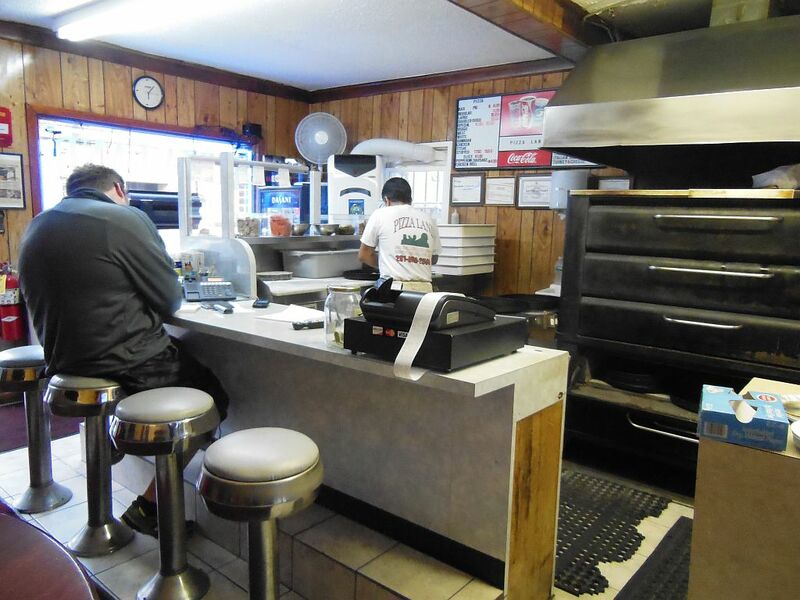 One guy worked the kitchen in the back readying pizza dough plus any other non-pizza menu items (calzones, salads, sandwiches and a few Italian entrees). He also seemed to be the one getting the orders together for the delivery guy who must have been out on the road. Another guy sat at the counter in a track suit answering the phone and taking the orders. The busiest guy, though, was the cook who steadily worked making the pies. After a few minutes in the oven, my slices were delivered screaming hot. They were absolutely delicious. Pizza Land’s pie is quite different in terms of the thinness of both the crust and cheese. It was one of the oiliest slices I have ever had; however, it was so fresh and tasty that I didn’t mind. The hot cheese and sauce went together hand in glove perfectly. Although the slices were crisp, they did get a little floppy. Their diminutive size made them easy to manage regardless. 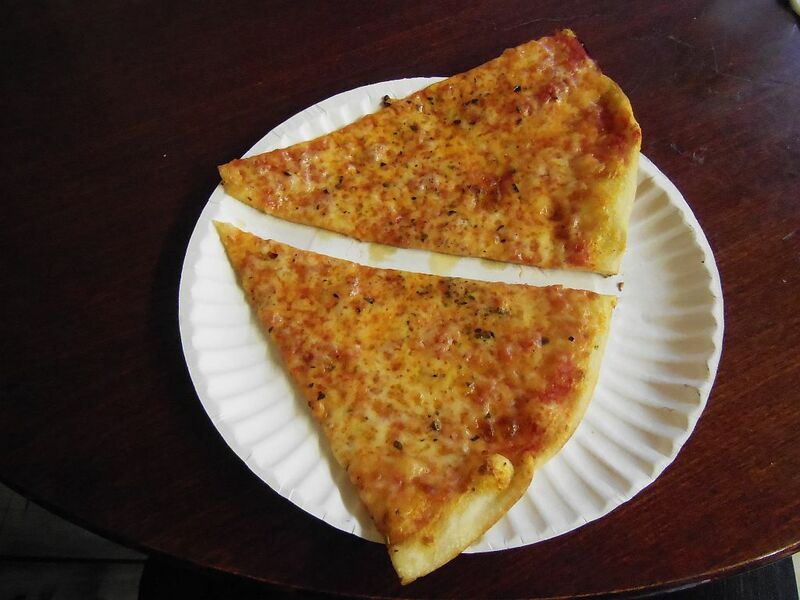 I have to say that their slice is unique. In a line-up, it would be easy to spot a slice from Pizza Land. Wanting more, from my table seat I asked the busy cook for two more slices “as soon as he got a chance.” Perhaps surprised by my Southern courtesy, he somewhat apologetically said that he wasn’t too busy for me and fired up two more for me that were just as yummy as the first two. As I left, I noticed a photo of the Soprano’s cast hanging atop the door. I am sure they would agree that without a doubt this is one of the best pies in Jersey—fuhgeddaboudit!